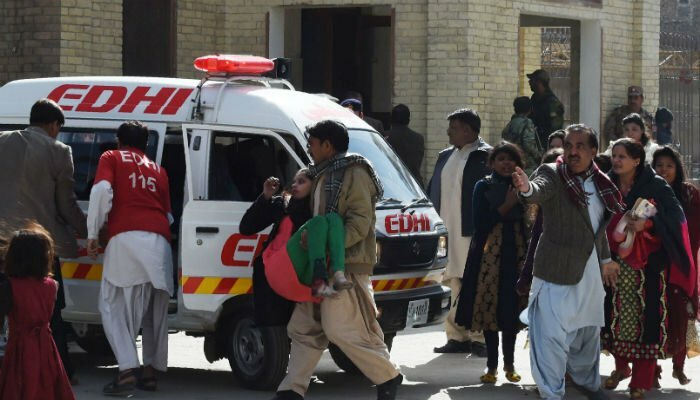 QUETTA: The death toll in Bethel Memorial Church attack reached nine after one more woman succumbed to the wounds, while more than 50 others were injured in the incident, a spokesperson at Civil Hospital, Dr Waseem Baig, confirmed to Geo News. Dr Baig said nine of those being treated for injuries were in critical condition. 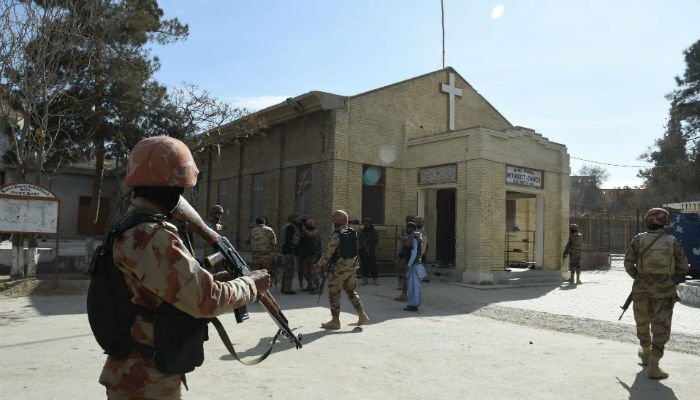 Balochistan Home Minister Mir Sarfraz Bugti told Geo News two suicide bombers stormed the church, one of whom was shot dead at the entrance. The other suicide bomber blew himself up outside the church hall. "The terrorists had weapons and it seems they wanted to take hostages inside the church. 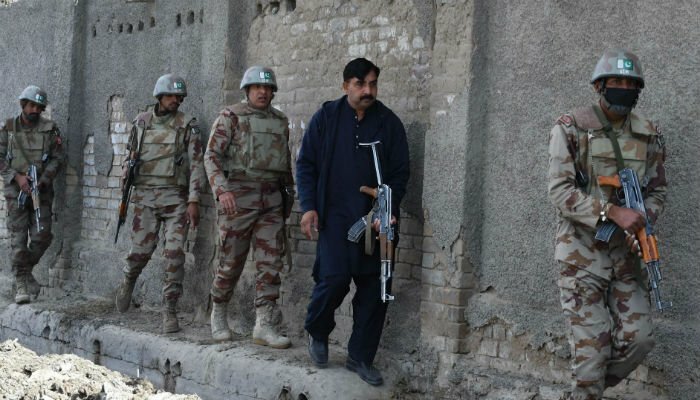 The police and FC guards present stopped this from happening," said Bugti. According to Mir Sarfraz, Pakistan was fighting the war on terrorism from the front and there were reports of such an attack taking place. 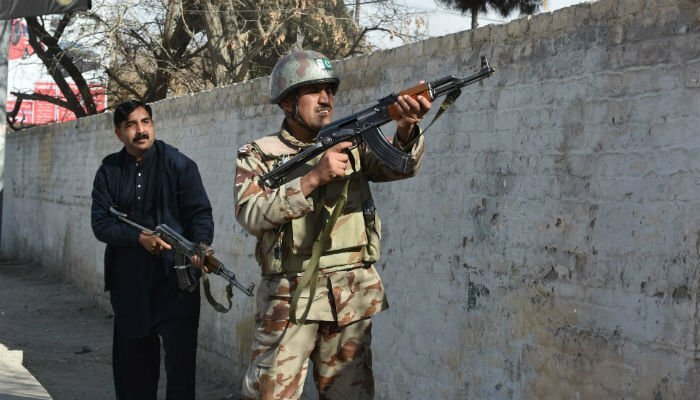 In a post on Twitter, Mir Sarfraz added that law-enforcement agencies took 16 minutes to complete the operation which was led by CCPO, DC Quetta and IGP Balochistan. “The terrorists were not able to enter the church. I saw glass breaking and people being shot,” an eyewitness told Geo News. 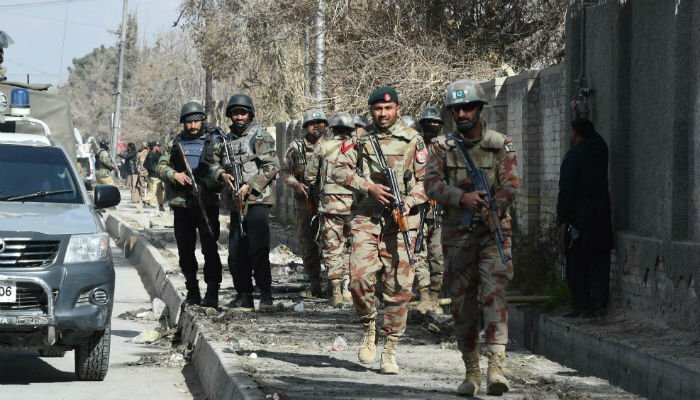 According to Quetta DIG Abdul Razzaq Cheema two terrorists were on the run after the attack and a search operation was under way. 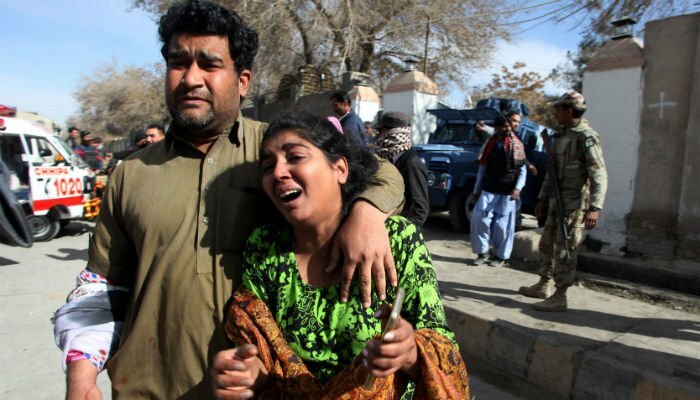 According to officials, the two suicide bombers were between the ages of 16 and 20. 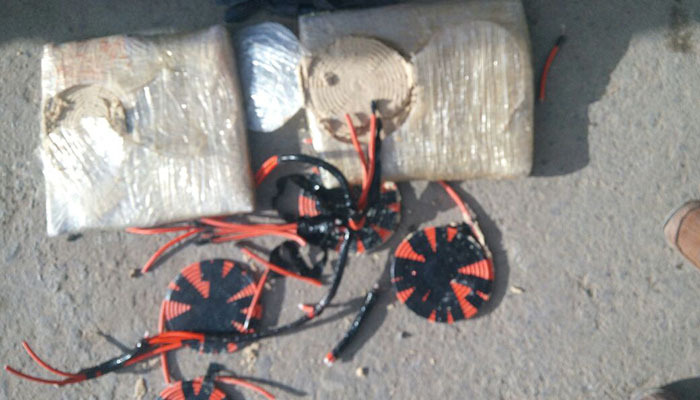 The suicide jacket which was defused contained 15 kilogrammes of explosive material. 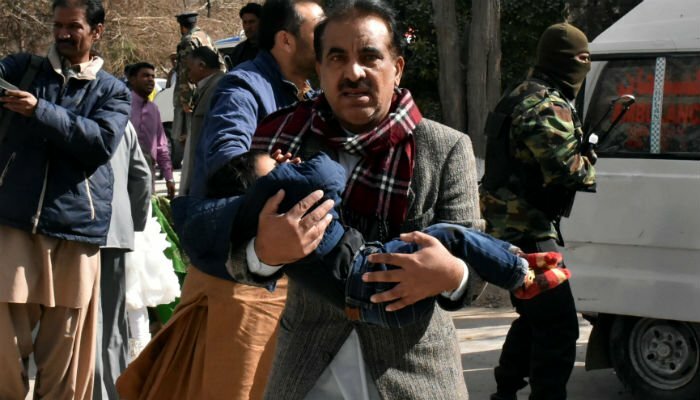 Balochistan Inspector General Police (IGP) Moazzam Ansari confirmed to media that 400 people were present inside the church at the time of the attack and a major tragedy was avoided due to the quick response of security forces. 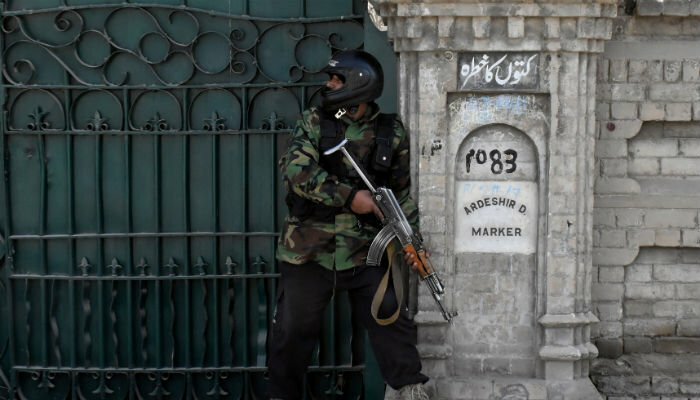 "The suicide bombers were unable to enter the main building of the church. 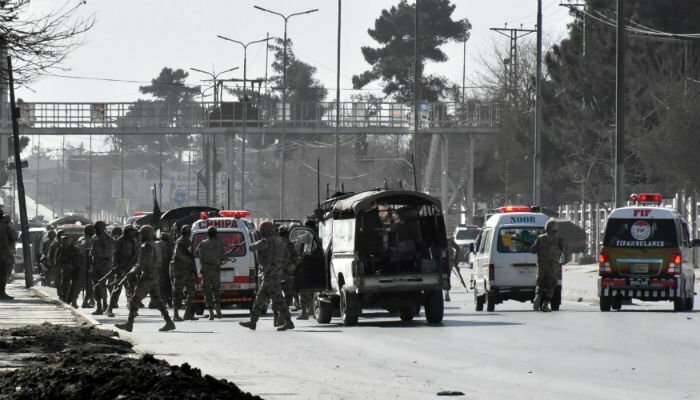 If they were able to do this and we did not have security deployed to neutralise them, they would have caused a lot of damage," said Ansari. "Security forces have cleared the church." 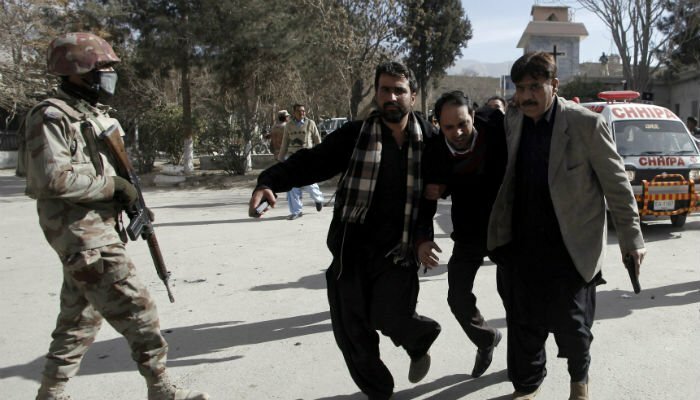 Balochistan Chief Minister Nawab Sanaullah Zehri has ordered a report pertaining to the attack from IGP Balochistan. 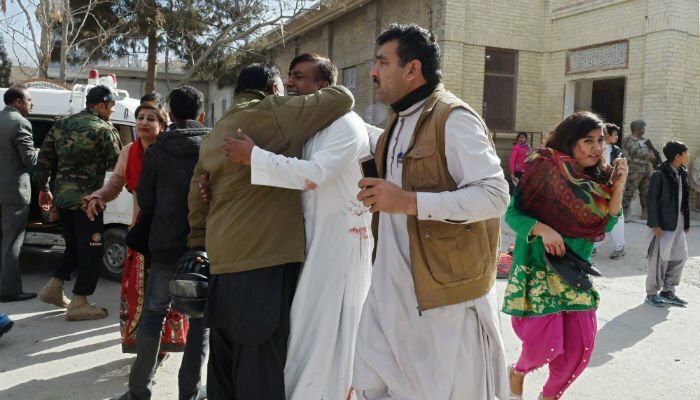 The church had organised different programmes all throughout December to mark Christmas, according to its Facebook page and was holding a ‘Sunday School Christmas Programme’ at the time of the attack. Later in the day, Commander Southern Command Lieutenant General Asim Saleem Bajwa arrived at the Civil Hospital. The Commander was accompanied by Inspector General of Frontier Corps Major General Nadeem Anjum and other officials. Lt Gen Saleem Bajwa and Major Gen Anjum visited the hospital’s trauma centre and met with the victims of the attack. 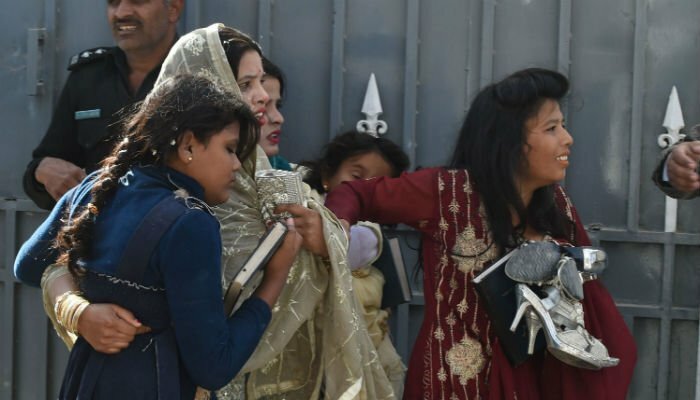 Chief of Army Staff (COAS) General Qamar Javed Bajwa said the attack targeting our brotherly Christian Pakistanis was an attempt to cloud Christmas celebrations and create religious cleavages. “Effective response by LEAs is commendable. We stay united and steadfast to respond against such heinous attempts,” General Bajwa added. Ministry of Foreign Affairs Spokesperson Dr Mohammad Faisal condemned the attack. 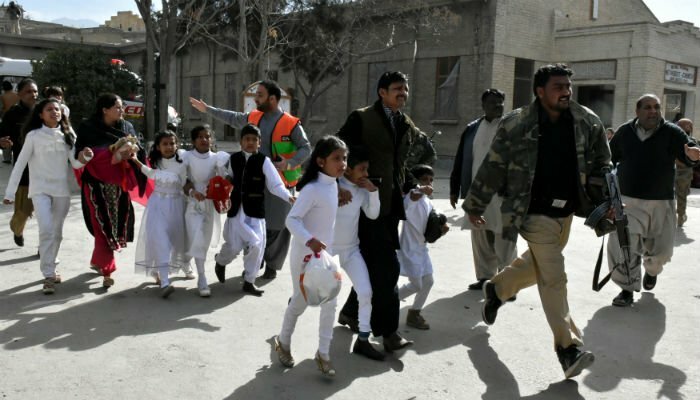 He shared on Twitter: "Attack of terrorists on Zarghoon road church in Quetta is condemned. Pakistan’s resolve against terrorism cannot be deterred by these cowardly acts." President Mamnoon Hussain strongly condemned the terrorist attack and expressed grief at the loss of innocent lives. He also directed authorities to ensure best medical treatment possible for the injured. Terrorists will be taken to their logical conclusion and their cowardly attacks will not weaken the nation’s resolve, he said. 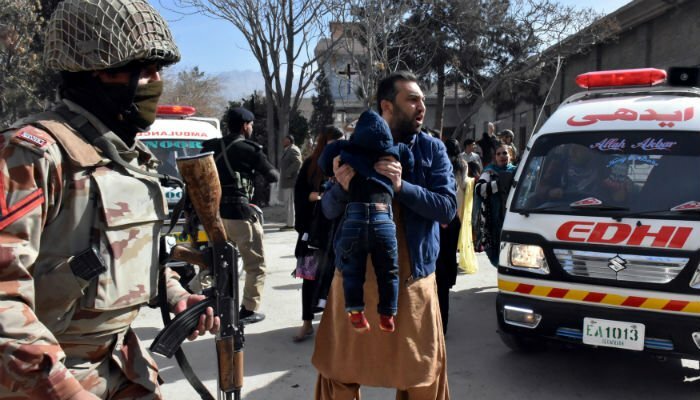 Interior Minister Ahsan Iqbal condemned the attack as a sign of “cowardice” and said Pakistan’s enemies want to spread violence in the country. “We are fighting a war against these terror elements,” he said. 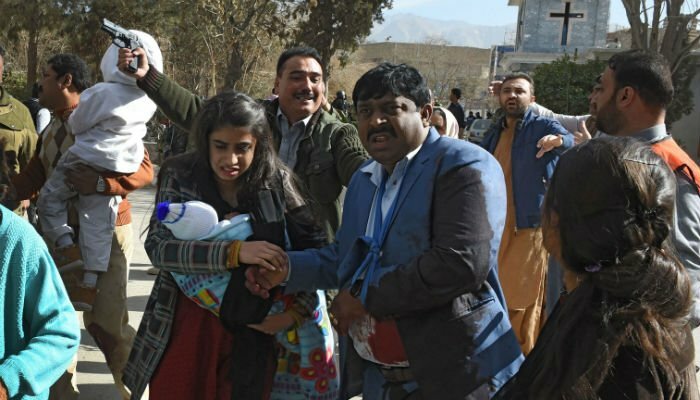 Sindh Chief Minister Murad Ali Shah condemned the attack and expressed his solidarity with the people and government of Balochistan. “The attack on the church was a cowardly act by terrorists,” he said. Former prime minister Nawaz Sharif, condemning the attack, said those who target places of worship do not believe in religion or faith. He also expressed solidarity with the families of the victims. Pakistan Tehreek-e-Insaf Chairman Imran Khan strongly condemned the terror attack. "The govt must ensure special protection for churches as Christmas approaches. My prayers go to the victims' families and for the speedy recovery of the injured," Khan tweeted. 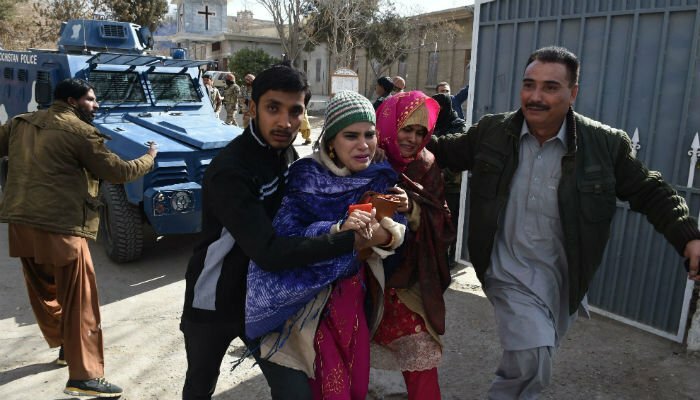 On March 15, 2015, fifteen people were killed and more than 70 injured after Taliban suicide bombers attacked two churches in Lahore’s Youhanabad neighbourhood. 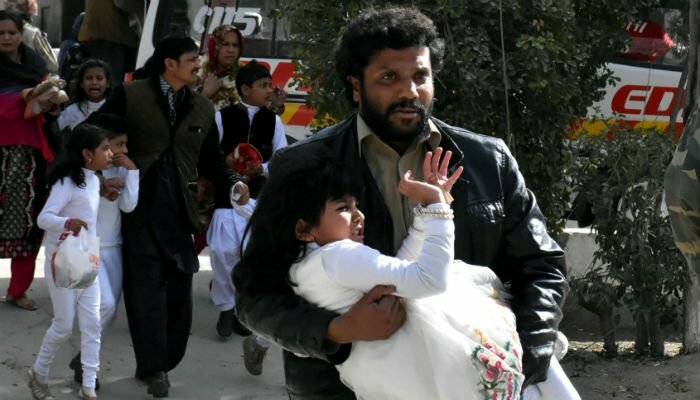 On September 22, 2013, 80 people were killed and 100 wounded after twin explosions at All Saint's Church at Peshawar's Kohati gate. Way to go Pakistan Security Forces. Thank you !